In February 1900, the man who would become Australia’s first Prime Minister missed his train. According to Sydney’s Truth newspaper, Edmund Barton had alighted from the train at Moss Vale and nipped into the Railway Refreshment Room for a shot (or several) of whisky. Barton was a rotund gentleman whose liking for food and drink had earned him the soubriquet of ‘Toby Tosspot’. Until all the diff’rent colonies in one big union blend. Might result in the abortion of the coming Fed’ral State. Railway Refreshment Rooms had been a part of Australia’s transport history since shortly after the first steam trains chugged their way between Melbourne’s Flinders Street Station and Sandridge – what is now Port Melbourne – in 1854. In 1855, the magistrates at Melbourne’s City Court granted a licence to William Peter McGirr for the first Australian RRR at Sandridge. The following year, Henry Clifford obtained a license for the one at Flinders Street. Queensland’s first railway opened in 1865. Among the first to offer refreshments was Mrs Littleton of the Royal Hotel in Toowoomba, who operated a purpose-built establishment close to the station. Many more followed. The first RRRs in New South Wales were at Mittagong and Mount Victoria in 1873, soon followed by establishments at Sydney’s Central Station, Penrith and Singleton. As railways expanded in all states, the refreshment rooms expanded with them. Steam engines needed regular stops to clean the firebox and take on water. It followed that passengers should be fed and watered at the same time. 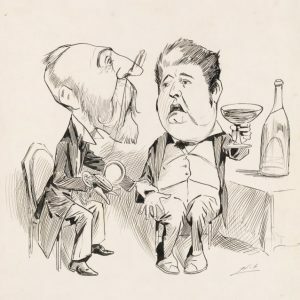 While there were some rooms that provided only tea and coffee to drink, most also served alcohol, leading to repeated wrangling with the temperance advocates. In March 1881, John A. Liddelow advised the good people of Western Australia that having been successful in his application to run the Railway Refreshment Rooms he would be providing wines, beers and liquors of the best brands, along with cordials, tea, coffee, pastry and confectionery. However, by August, moves were afoot in Council to close his establishment in Perth or at least stop him from selling liquor. The Geraldton paper commented “It is to be hoped that this interference with what has been found a public convenience will not be successful”. Sometimes the lure of the bar was just too much for passing travellers. In December 1939, troops from the Second A.I.F., en route from Sydney to Melbourne, stormed the bar at Moss Vale and began to help themselves to bottles of beer and spirits. The police had to be called to restore order. At Goulburn station, the bar was placed out of bounds. Even so, some rooms were known for the quality of their food. The refreshment room at Cardwell in Queensland was noted for its fish, while in South Australia, correspondents to the Adelaide News praised the food at Gawler and complimented the management for its economy, efficiency and courtesy. Over the years, tragic stories emerged from the nation’s railway refreshment rooms. We hear of the proprietor in Bathurst who, to the surprise of locals, cut his own throat. Or another lessee who, crossing the line at 11pm, was mown down by the passing express. A sad loss of life occurred in the Bay on Saturday. A waterman’s boat put off from the railway pier, with a young lady named Hall, and manned by two watermen. In standing for the Storeship Una, the boat struck upon the sunken wreck of the Columbia, and immediately sunk. Some ballast men on the beach at once put off to render assistance, and succeeded in rescuing Miss Hall and one of the men. The other waterman was drowned; and we regret also to say that Miss Hall, after exclaiming, “Oh dear,” gradually sunk, and died soon afterwards at the railway refreshment rooms. 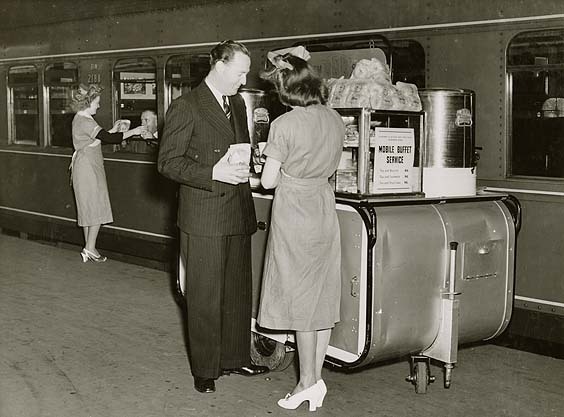 Railway Refreshment Rooms’ new mobile canteen at Central station got out of control while being attended by two girls early today, and crashed on to lines where the Western Mail was expected. Railway employees ran to a signal-box, and the express was switched at the last minute to another platform. The canteen was wrecked, and will be out of commission for weeks. No doubt feeling it needed to boost the image of its refreshment division, in 1954 the New South Wales railways released figures to demonstrate the significance of its task in feeding the travelling millions. 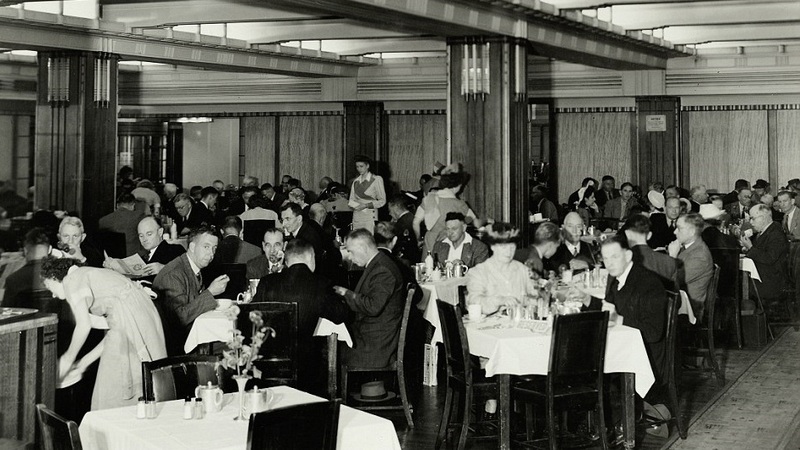 As the largest catering establishment in Australia, with a staff of 1500, it controlled refreshment rooms, kiosks, milk bars and even full railway accommodation at six country stations. “The department has a special sandwich room at Central Station, Sydney, which makes 1,750,000 sandwiches a year,” a railway correspondent (aka PR person) reported. Each year the Railway Refreshment Rooms also accounted for 95,000 lbs of bacon; 235,000 4lb loaves of bread; 120,000 lbs of butter: 40,000 lbs of cheese; 14,000 lbs of coffee; 37,000 lbs of eggs; 320,000 lbs of flour; 12,000 gallons of fountain syrups; 20,000 gallons and 750,000 buckets of ice cream; 200,000 gallons of milk; 260,000 lbs of sugar; 33,000 lbs of tea; 900,000 lbs of meat; 26,000 lbs of fish and 150 tons of potatoes. Not to mention 150,000 gallons of beer and 100,000 dozen bottles of aerated waters. This was not to last. With the introduction of diesel engines from the 1950s, trains no longer had to make frequent, lengthy stops. With no time to enjoy a meal en route, passengers made do with buffet cars on the trains. The railway refreshment rooms, with their white tablecloths and proper crockery, became unprofitable and closed down. 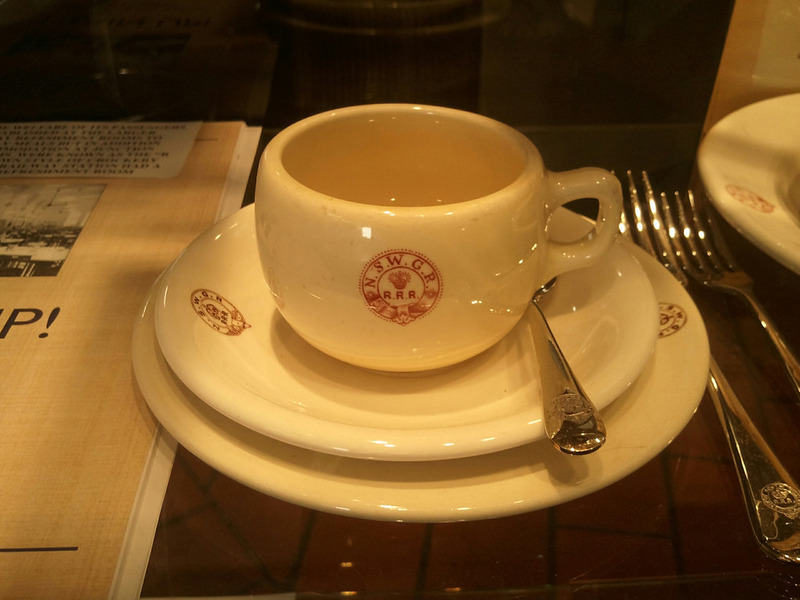 A few have re-emerged as cafés. The one at Toowoomba station is still a grand affair – a reminder of the era when ladies wore gloves and hats to travel and expected to eat in style. 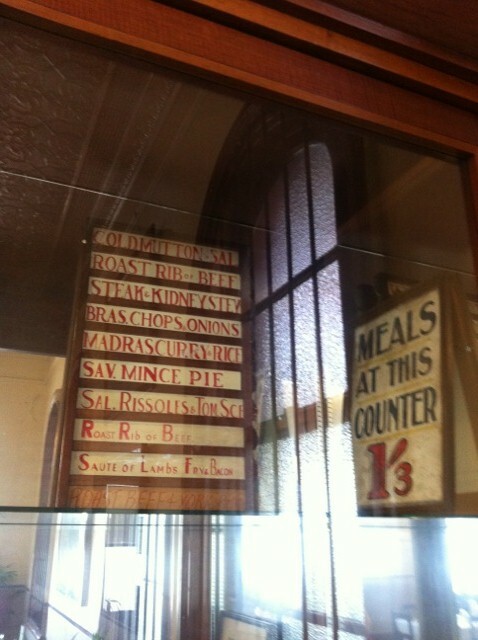 It even displays a menu from the time when meals were just one and threepence. Anyone for cold mutton and salad?